Manufacturing exhibitions are a great way to network and advertise products and services. Southern manufacturing is arguably one of the best for this. This manufacturing trade show has a large turnout each year. This means there’s a large audience of people who you can showcase your company to who are interested in manufacturing and could be looking into new products and companies. SCHURTER returned to the exhibition this year and it was noticeable how much it had grown from previous years. The level of planning that had gone into making the exhibition run was evident and it seemed to work better. Factors that made the exhibitions popular. Full Program of FREE technical seminars. Why doing the exhibition is worthwhile. This gave SCHURTER a chance to engage in conversations with people who were generally interested in our products. There was a variety of different exhibitors, from many different markets. This included Materials, Aerospace, Automotive, and Electronics, defence & security and Energy. This offers a variety of industries exhibiting a wide selection of products. 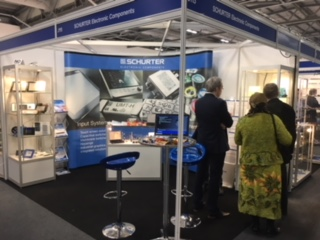 SCHURTER would recommend the Southern Manufacturing exhibition to any company that wants to showcase their products and services to potential customers. Finally, to everyone that we met at the exhibition, it was good to meet you and we hope you found the exhibition as good as we did. If you liked this post then feel free to like and share.